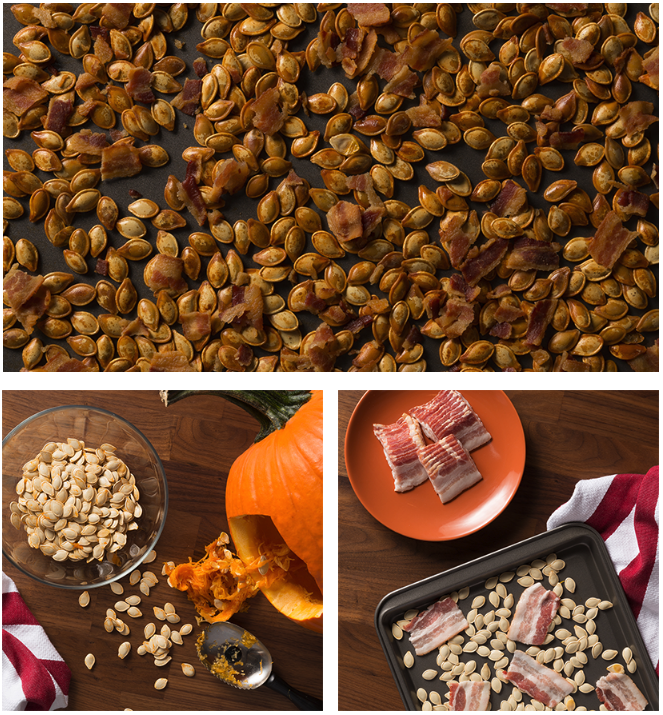 Put your pumpkin seeds to good use with this delicious recipe. Rinse the pumpkin seeds, removing the pulp. Pour the seeds into a large pot, add water and one tablespoon of salt. Drain and spread the seeds on a rimmed baking sheet. Cut the four slices of Gwaltney Bacon into small pieces and place them in the pan with the seeds. Bake the pumpkin seeds for 25-30 minutes at 375 degrees, stirring and turning the seeds every 5 minutes, until golden and crunchy. Mix up the seeds and bacon and enjoy.